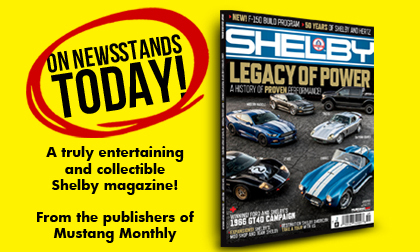 Beginning in 2007 (on sale as a 2008 special issue) Mustang Monthly magazine’s editors have worked hand-in-hand with Shelby American, Team Shelby, Shelby Licensing, and its partners to produce a truly entertaining and collectible special magazine issue we call the Shelby Annual. Each year some of the best contributors and Shelby experts from all over work together with us to bring Shelby fans historical features, the latest Shelby news, Team Shelby events, and much more. It’s been a huge hit and sells out quickly, so we wanted to make sure that Mustang Monthly readers knew the 2016 edition will be on sale at your favorite book and magazine retailer beginning Friday, October 21st. You’ll want to get yours quick, because they’ll sell out fast and when they’re gone, they’re gone!